Water resistant polyester. Two tone jacket with adjustable cuffs and storm flap. Concealed hood and two front pockets. High visibility reflective tape. Padded and fulle lined. 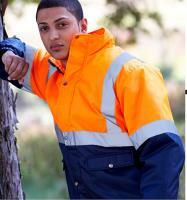 High quality unisex safetywear.